The Broadleaf Commerce Admin provides the ability to granularly control the access rights for admin users. Represents a user with a login and password to access admin functionality. A user can be assigned one-or-more Roles as well as one-or-more Permissions. A role represents a group of Permissions. Generally, a user is assigned a role like "Content Editor". The role would be setup to contain all of the permissions necessary to complete that role. A permission represents a privilige to do some functionality within the admin. Examples could include "View Customers" or "Manage Products". 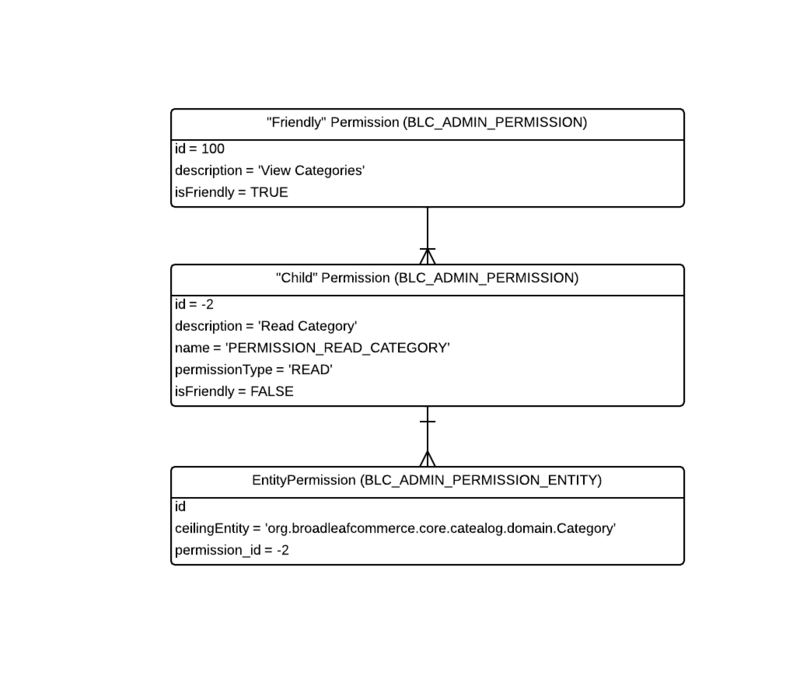 While this basic permission model is easy to understand, Broadleaf provides a couple of additional technical details that are important for those adding custom permissions and capabilities to understand that are discussed below. The menu items that an Admin User sees are related to the permissions that they have. For example, consider the following SQL that was pulled from the load_admin_menu.sql file. -- Here is SQL the defines permissions for Viewing and Maintaining categories. -- Finally, the section is associated with permissions that allow the user to see that menu item. The Broadleaf Admin provides a lot of functionality with a very tight security model. When a user is given a "Permission", the system needs to understand what underlying Entities (think tables) that they can view or modify. This can sometimes be quite involved. For example, consider a user that can edit products but not categories. In this example, the user would need "Edit" access to Products but "View" access to categories since one of the properties on a product is it's default category. To handle this (and much more complex scenarios), Broadleaf has the following logical permission model. Some notes about the above diagram. Both "Friendly" and "Child" Permissions live in the same BLC table. Child Permissions have a permissionType which can be READ, ALL, DELETE, UPDATE, CREATE. Broadleaf only uses READ and ALL but the others are available for custom solutions. EntityPermissions directly relate to the underlying JPA objects (like CategoryImpl.java). For the lastest on this, consult your admin or look in the actual permission SQL files. Below you will find each of the out of box menu items with it's friendly permission, child permissions, and entity permissions in the following structure.